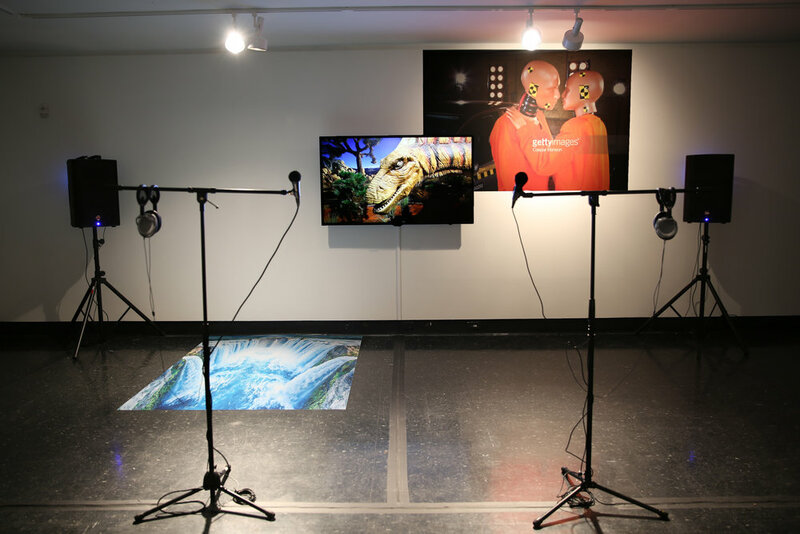 This karaoke installation invites viewers to participate by singing a long with popular songs inserted into a single channel video. The video takes the point of view of a travel essay (or home movie) of a dinosaur couple on a road-trip while in the midst of a mid-life crisis. The dinosaurs travel through a town in Texas famous for dinosaur fossils, which has created an infrastructure of dinosaur-related businesses in and around the town ranging from a theme park to the Creation Evidence Museum which promotes the idea that God created dinosaurs alongside of humans and other animals. The point of view is at some point reversed as the anthropomorphized dinosaurs look at and study the life style and cultural beliefs of rural Americana through the symbols and cultural tropes of the dinosaurs themselves. The existential conversation between the dinosaur couple touches on procreation and extinction, ideas of masculinity, maternity and the apocalypse.